White is a color that some think is boring and bland. But that is far from the case. A neutral color palette allows you the freedom to add personality to a space with accessories and furniture without worrying about colors clashing. And white is the perfect neutral backdrop to allow the details in a space to shine. 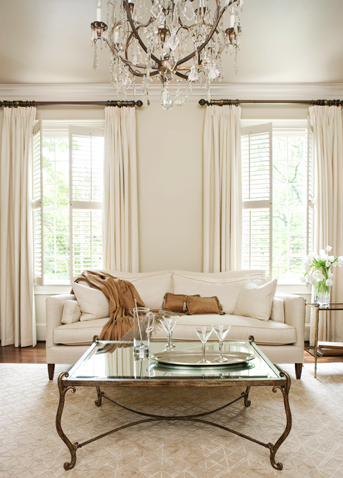 Veranda published an article reinforcing that white is all you need for a space. We agree and want to reiterate this sentiment. Here are some fabulous white interiors that are proof that a monochromatic color palette is anything but boring. Take this white master bathroom. The neutral color palette provides a cool and calming feel, making the space feel refreshing and spa-like. The white backdrop also allows the cabinet detailing, sconces, and bath accessories to take center stage. White also provides a great way to incorporate contrast in a space. With white being the main backdrop in this sunroom, the dark trim around the windows and doors really pops and adds a dramatic element that is far from boring. While white allows you freedom and flexibility when it comes to your furnishings, sometimes it's just as beautiful to go neutral with your furnishings as well. With all the white furnishings and wall color in this living room, the brass finishes of the curtain rod, chandelier and coffee table really make a statement. A neutral white wall color does allow your furnishings to pop like we mentioned. The warm wood in the bed, chest and side table in this master bedroom really stand out and draw your attention to each side of the room. Using neutral accessories also allows the wood furnishings to pop. This white kitchen is another beautiful example of a neutral space. The crisp white cabinetry, ceiling, and trim give this kitchen a clean and elegant feel while the countertops and wood floors bring in warmth. These elements along with the beige wall color make this space feel far from sterile. 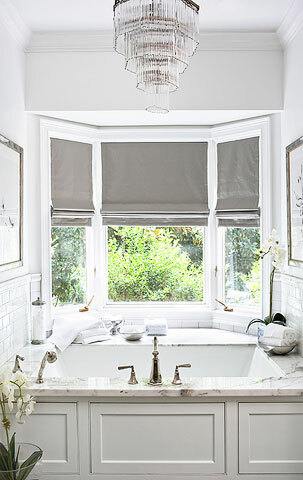 This is another example of a beautiful white bathroom. 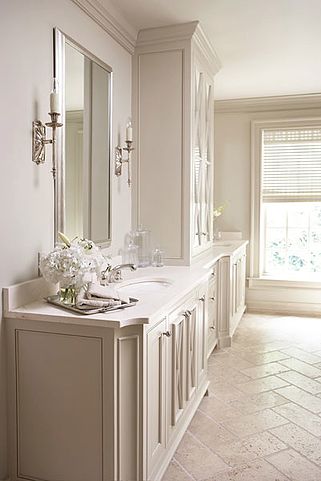 Using white in a small space like a bathroom allows the room to feel brighter and appear more clean. The monochromatic accessories make this space even more dazzling against the white backdrop. How do you feel about white? Do you think it's boring or beautiful? Do you like the look of this crisp bathroom? To see how you can get the look yourself, check out our designers' corner of our online boutique to learn about some of the furnishings and accessories you see.